Xiangzimen International Youth Hostel is set in a 'very good location, close to the South Gate where you can rent bikes and ride along the city wall', as our guests say. It's also about 15 minutes' walk from the Muslim Quarter. This friendly hostel features free Wi-Fi, free coffee and beer and free pick-up from the train station. We like their weekly dumpling parties, where it's easy to meet other travellers. Happy time:Pool table game at every thuesday night！Dumpling party-every friday night! It is said that the brother of the Song dynasty Emperor, Zhao Kuang Yin used to reside here in this very building, which has over 200 years of history, and for this reason has been especially preserved in Ming dynasty style by the Xi'an government. It is the only building of its type in the whole of northwest China, and is divided into two main parts: the front siheyuan with it's open-air courtyards and exquisite masonry, and the back with wooden panelling recreated in traditional ancient style. The charming atmosphere and friendly staff will instantly make you feel at home. 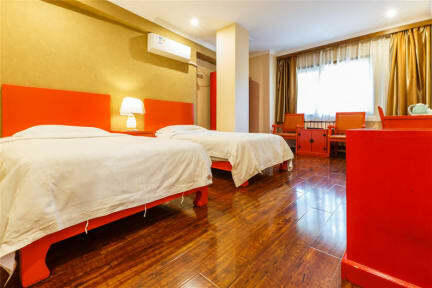 We are conveniently located in the heart of Xi'an - there is no need to take a taxi to any of the local sights, they can all be reached by foot within 10 minutes. Right outside our front door is the centre of Xi'an's nightlife, bar street (defuxiang) where there are plenty of bars and coffee houses where you can relax with locals or other travelers from all parts of the globe. And right outside the back door is the imposing South Gate, where you can scale the Ming dynasty city walls and command an Emperor's view of the whole city. Here you can truly escape form the hustle and bustle of city life, yet only 100 meters from our door lies South Street, one of the four main roads within the centre of Xi'an's city walls. Xiangzimen truly is a home-away-from-home with unique features such as red lanterns, carved stone benches and giant vessels filled with vibrant fish adding to the character of the place. If you have any problems here just ask any of our reception, bar or restaurant staff who will be able to help you. We offer information on all local tours, and it's possible to book tickets here, to suit all tastes and budgets. We can also help you buy train tickets to other destinations in China, and even help you to get a permit to enter Tibet. This is a great place to start exploring Xian city center. Located just few hundred meters from the city walls and 5 min walk to the bustling muslim district. Rooms are tidy and warm (we were there in winter), and the staff is indeed very kind. 100% suggested! This hostel is stunning from the bar to the restaurant to the rooftop terrace. This place is really gorgeous. Rooms are perfect and bathroom is super modern and clean. Really central near the south gate where you can go see a show around 7. Right next to the party street also if youre looking for somewhere near there. This place it’s amazing and the staff are super helpful!! Very nice hostel with a bar and friendly service. We did 2 tours (Mt. Hua Shan and Terracotta Warriors) through them, both of which were good values. We had an issue with our shower not draining which they came immediately to fix. We ended up staying an extra night as there is so much to do in Xi’an and they accommodated us with no problem. Location is great and close to South Gate, subway, and easy walk to the Muslim Quarter. Highly recommended for a comfortable stay in Xi'an. Fabulous location in the heart of the city ! An easy walk to Muslim street. The hostel’s entrance/restaurant area was pretty cool with their eating nooks. It wasn’t that busy ever but I’m sure the place fills up during high season. Hot water shower pressure was good ! Nice hostel right inside South Gate of Xi’an. Close to subway, shopping, restaurants and not far from Muslim quarter. Room was small, but sufficient. No window in room to outdoors, but made the room nice and quiet. They supply locker with key, so you can’t use your own lock.. Staff were helpful when I asked, always someone who spoke enough English. Mostly Chinese guests when I stayed (beginning of holiday golden week). I think what puts our hostel ahead of the rest is our location, our service and our well-equipped facilities. For instance, we offer free pick-up from the train station in the morning and a free beer or coffee upon arrival. We're also set in a traditional Chinese building with quadrangle dwellings. The city wall is one of the nearest attractions, just three minutes away on foot. I particularly recommend checking out the Muslim Quarter. There you can try local Xi'an food and snacks; it's like an open market, especially at night-it's very happening!